How do you bring alive the heritage of hospitality on a digital space? Subway as a brand was created to bring about freshness in the dietary routine of the American people, a philosophy which has trickled down during all these years of their growth and expansion in other countries. In India, as well it is an established fresh and healthy alternative to fast food. But as a brand that has kept the consumer’s attention so effectively in the stores by getting them involved in the food making process, their engagement with the consumers online, was ironically very low. 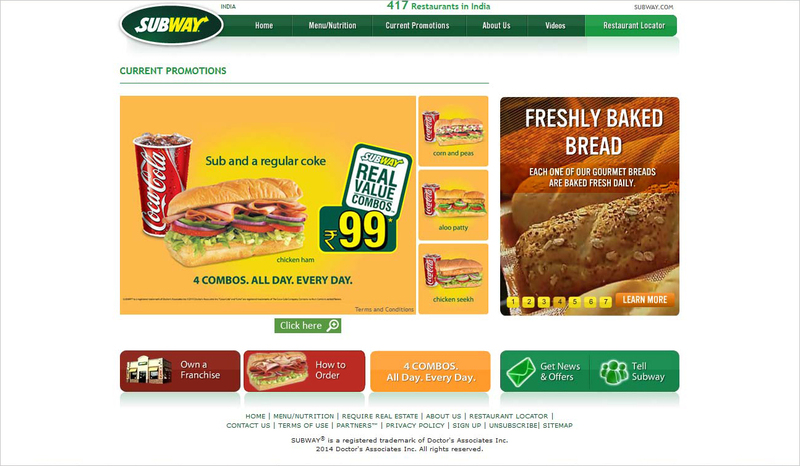 Subway had a pre-existing online presence in India and required a like-minded agency that could enhance the public's engagement with the brand and subsequently promote the image online. Their key issue was not their website, but a low organic traffic on their website. We took the essence of what Subway stands for as a brand and promote it online and drive the brand to the consumers through smart SEO and strategic promotions online. Our objective was that the brand should not only be visible to the online consumer, but simultaneously be positioned in their mind, as a fresh, nutritious and healthy brand. Having the consumer engagement with exactly the right image projection online, improved Subway's online rating drastically. But more essentially, it became easy to find, the brand online which generated a positive impact as people actually started to find them and developed an opinion about them. We were also involved with the upkeep and maintenance of their website, and have been doing so inline with our promotion strategy, so at no moment shall the online content betray the larger picture of the brand.